The Arctic ocean is about 5.5 million square miles of water and sea ice floats on top of the ocean. Sea ice or the polar ice cap covers most of the ocean and some of the ice is perennial meaning it is frozen year around. The Arctic is surrounded by land in Greenland, Canada, Russia and parts of these countries as well as part of Alaska is in the Arctic Circle. 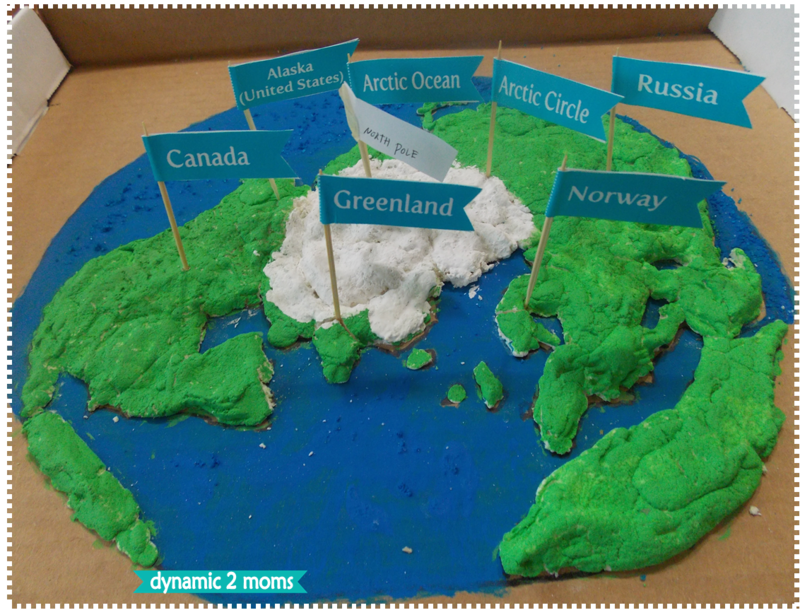 So I thought making a salt dough map would be the perfect way to show the geography of the land and polar ice cap. 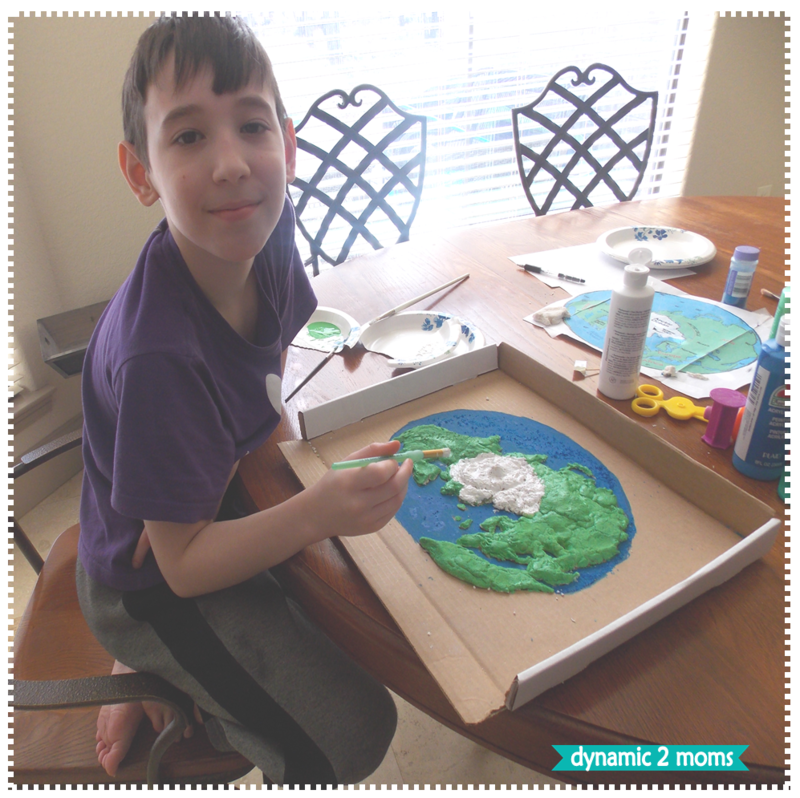 Salt dough maps are not only appealing to all ages but they are just plain fun to do. 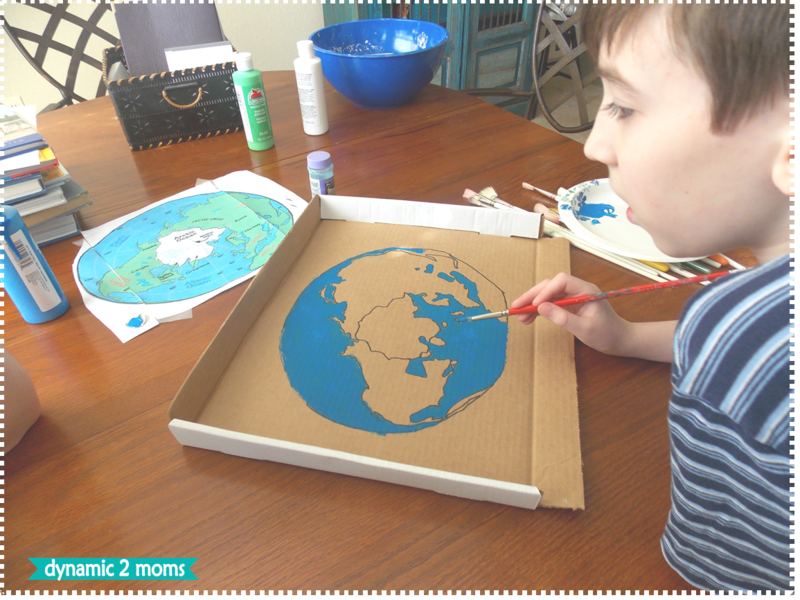 We had a bit of controversy in our house before we started this because the Arctic region covers land and the polar ice cap. 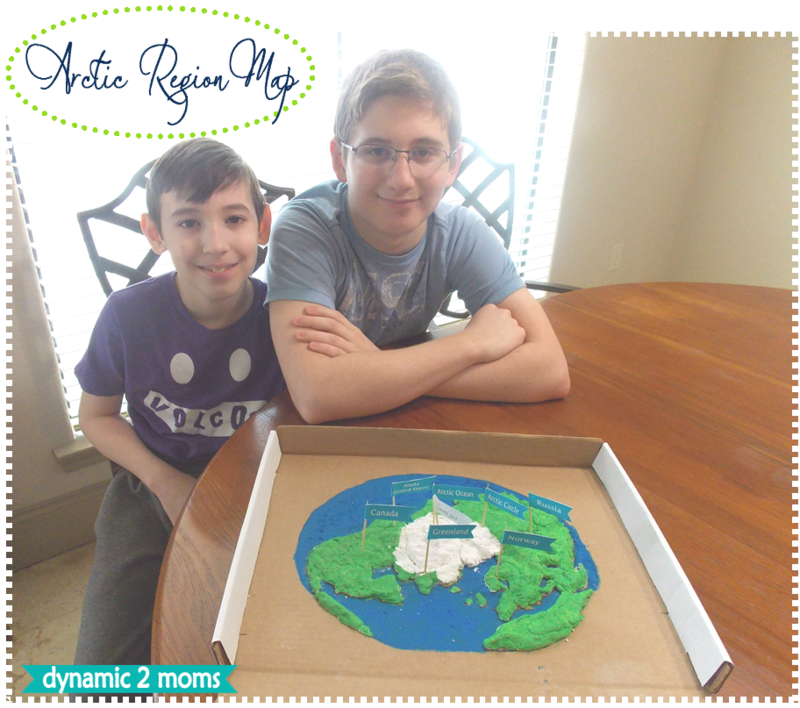 According to my boys the polar ice cap is like "frozen land" that is moving. So they wanted to be sure it showed up that way on the map. So they decided to give it "texture and form" by using the dough to show that portion. 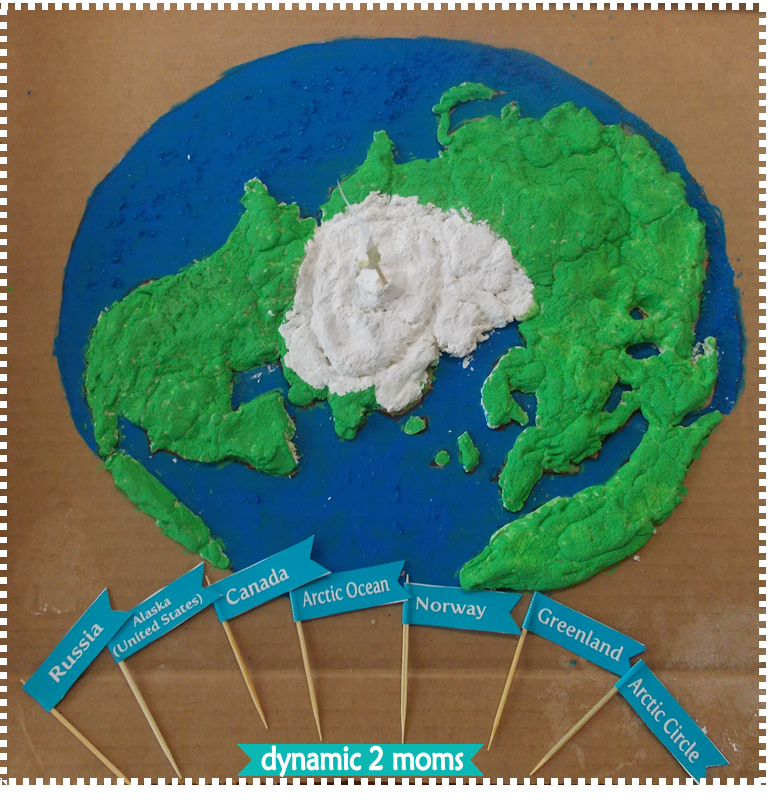 This is unique for us because unless we study the Antarctic, it probably will be our only salt dough map that looks like this meaning a portion is white. So many other parts of the world have defined land, water and land forms masses that are blue for water, green for land and brown for mountains. Having the white portion on the map representing the polar cap is unique. 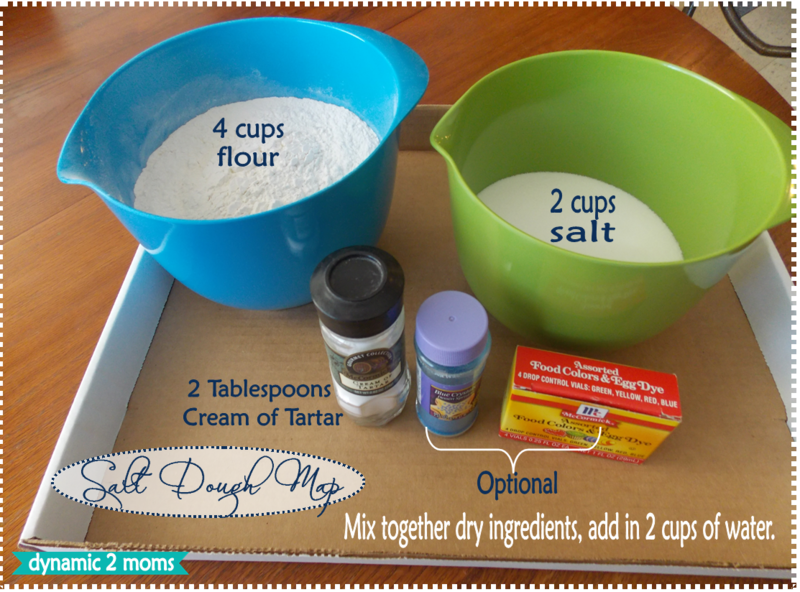 After deciding how to show that, we moved on and I found this wonderful page made by Jimmie here that gives some great tips on making the dough and a printable recipe. Dye is optional if you don't want to paint but we chose to paint ours this time. Tiny grabbed some blue glitter thinking that might work good on the blue or water part of the map. I don't have pictured the acrylic paint we used instead of the dye. 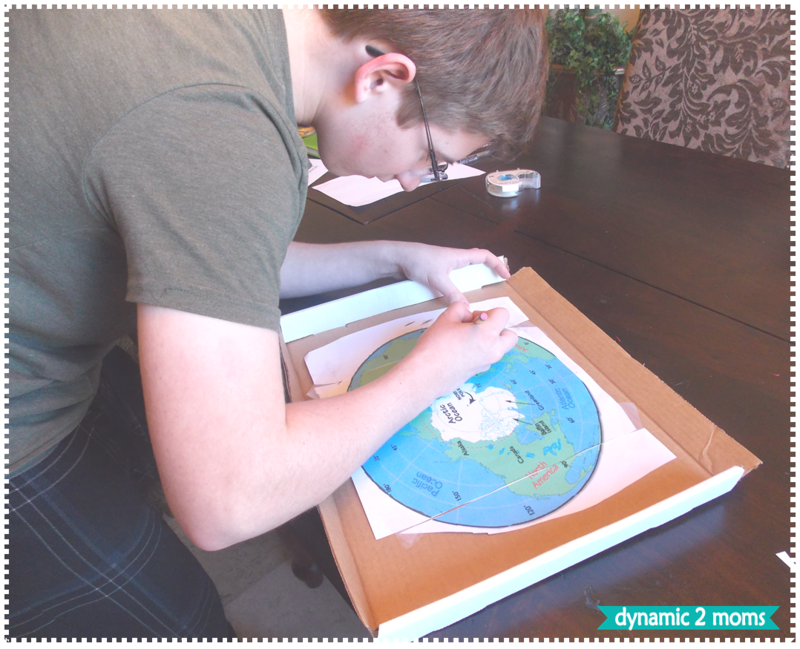 The map we used as a template is here by Atlas . I printed it across 3 pages because we used a cardboard lid that fit a box we done away with and too we didn't want our map too big. If we were focusing on one country we probably would have made it a bit bigger. Since this is the top of the world, we needed to keep it with an aerial view. Tracing over the map outline makes a faint outline afterwards. 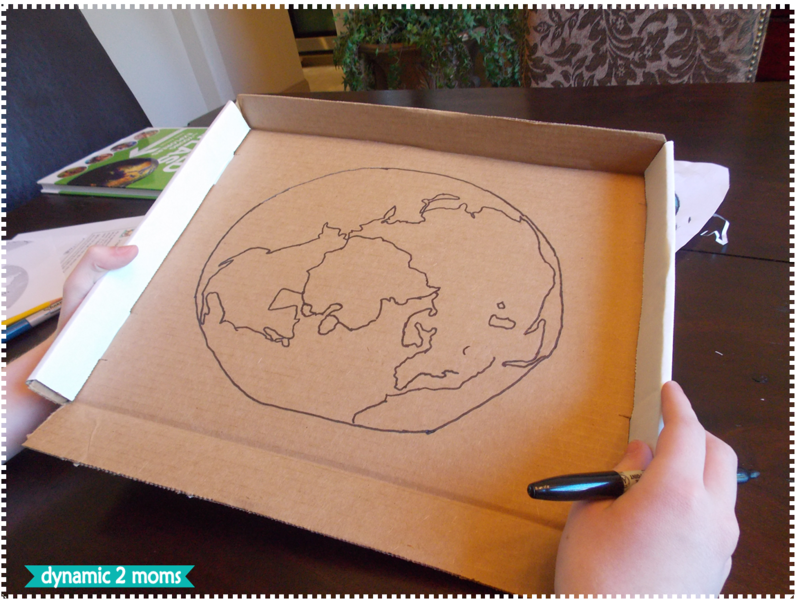 Kris over at Weird Unsocialized Homeschoolers has a great tutorial on how she made hers. 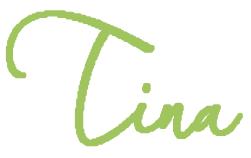 She explains how you need to color the entire back side of your map which is a nifty tip and then the faint outline is more noticeable. Also, if your template is big enough, at times, I have just glued the template straight onto the box and especially if is a simple outline you can just try free hand. In my earlier days, I used traced paper too. But this way is easy enough and we like it. 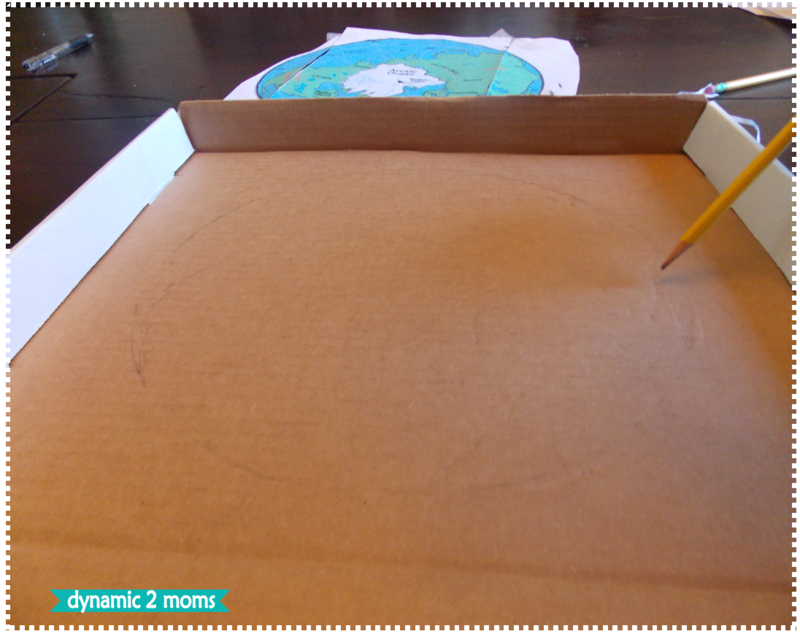 Then come back with a black marker to trace over your pencil outline. 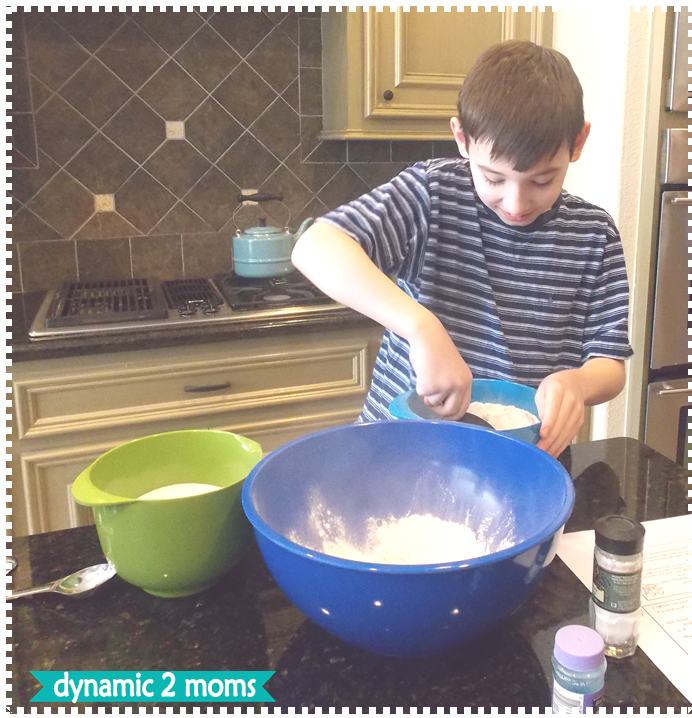 We went ahead and made our dough because Tiny couldn't wait a minute longer to get his hands into it. I do like to add in the cream of tartar because I think it makes the salt dough more smooth, soft and creamier. It also kept and didn't get dry while we went ahead and painted the water first. Then we started painting and it doesn't take too long for it to dry. 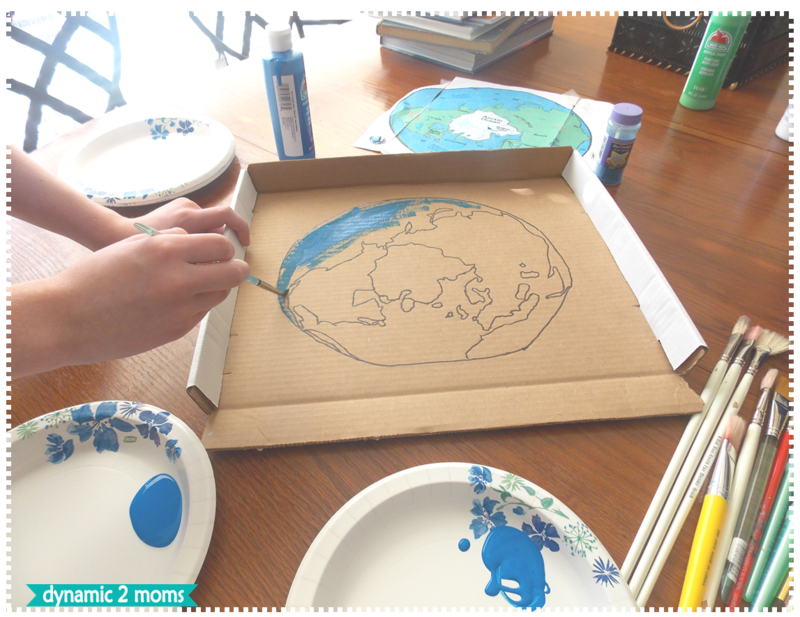 We like to paint the water or like Kris did, they spray painted their map which is a great tip too! Since we had paint, we used it. 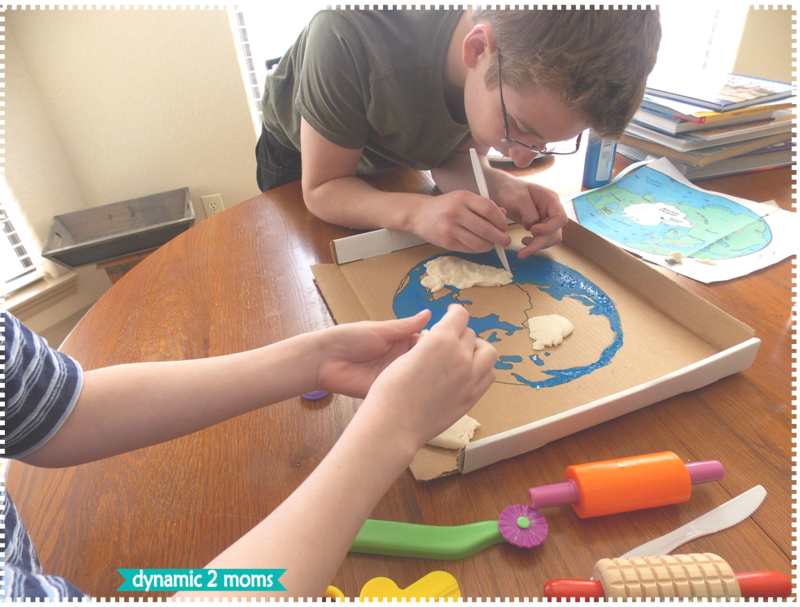 Then what is it about making this salt dough map that makes every kid bring out all the tools they have from their play-doh making days? Slowly, they formed the land and the frozen polar ice cap. We let our map dry for a day or two. I have read where you can put in the oven also to get it hard but you have to watch it. We weren't in a hurry so we just let it dry for a while after they painted it. Important: Don't forget to put holes in the dough where you want to put your map flags or tooth picks before it dries completely. It is hard to place them after it dries completely. We added one more country after it dried and you can use an ice pick and tap LIGHTLY so it doesn't crack. Kind of twist it and tap lightly and we got it in without breaking the land. The boys wanted to make their own flag for the North Pole so they added that before it dried. I created some flags so that we could locate these countries and areas. So we placed all the flags after we read about the area again. Ta da, all done and tons of fun. There is no better way to study geography. Okay, I can think of a few more ways but they all have to be fun. I have a little something for you too. I have made these flags on the Arctic. Also, I have flags that just have animals on it for the younger sweeties. You know most young kids equate countries or lands with where an animal lives. Land of the polar bear and land of the seals equals the Arctic. As they grow older, they know the countries, etc. So I created a set of map flags. 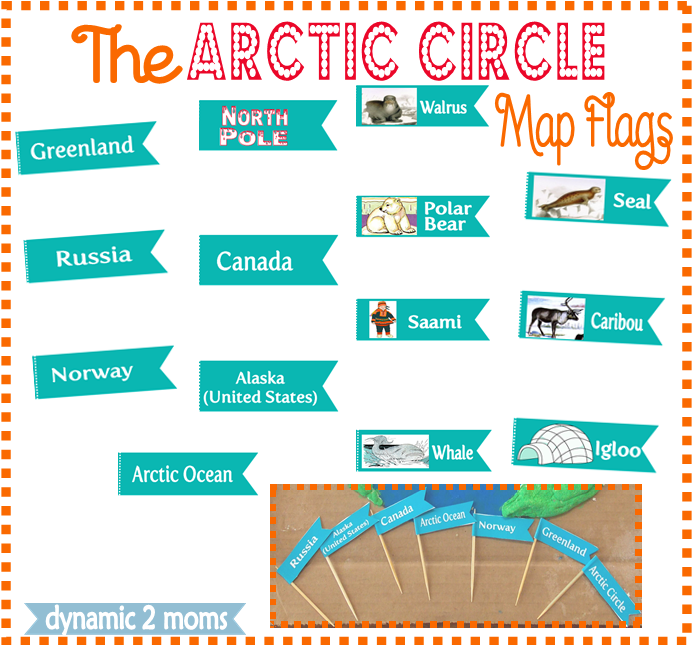 One page has the countries or regions, one is blank if you want to write them in yourself and one page has flags with the animals, igloo and the Saami, etc. Click here to download the map flags. 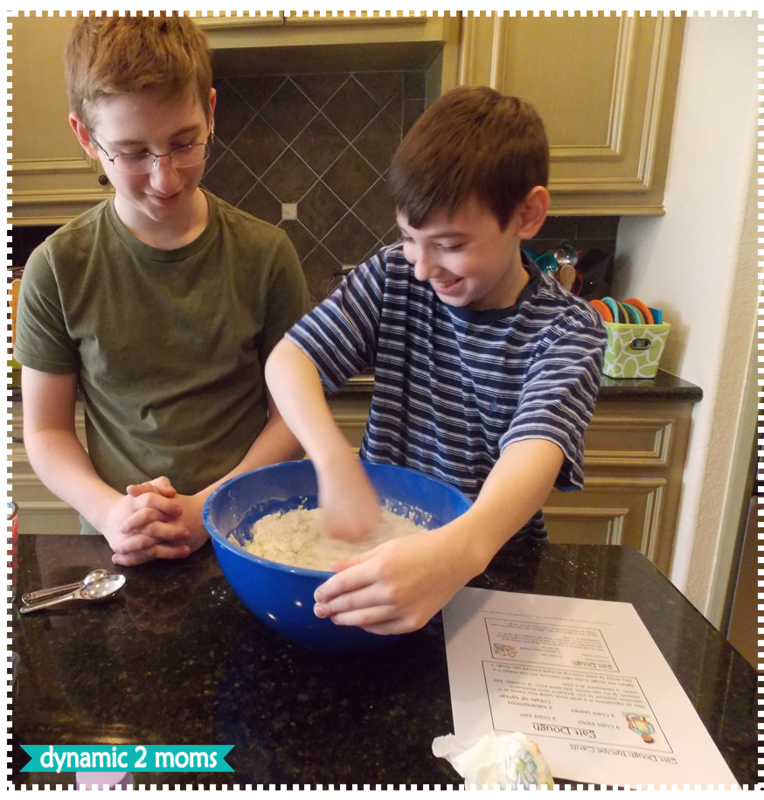 Have you tried a salt dough map? A guaranteed fun way to learn geography!